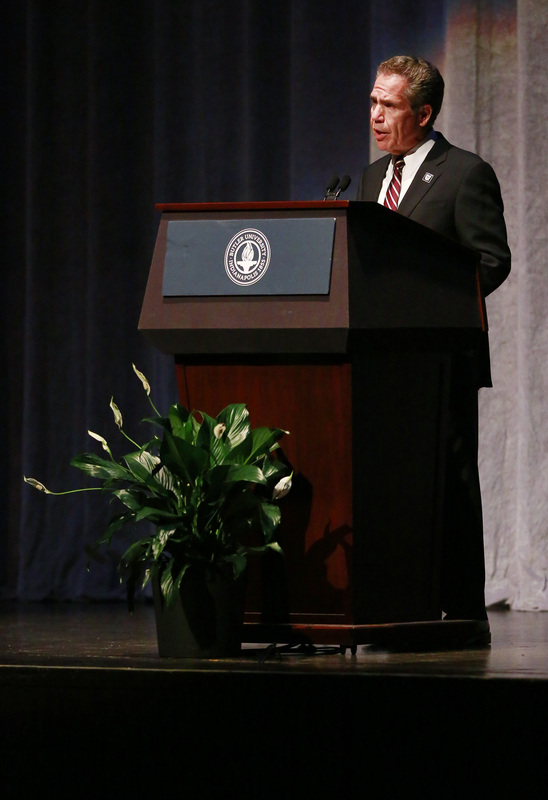 Butler University President JIm Danko speaks at Clowes Memorial Hall on September 25. Danko pointed to the University’s ability to innovate and successfully launch new programs—including, most recently, those in Interactive Media, Sports Media, Music Performance & Education, Musical Arts, Jazz Studies, Astronomy & Astrophysics, Environmental Studies, Recreation and Sports Studies, Healthcare and Business. Butler also launched new graduate programs, including the Butler-Schwab MBA partnership, the Physician-Assistant Program shift to a standalone Master’s Degree, and seven new non-degree certificate programs within the College of Education. But he is encouraged by the growth in first-year enrollment this year and the trend that an increasing number of Butler students are graduating on time, rather than returning for a fifth year.